Hi everyone! Today I have four easy diys to add some detail to your room! These can be used anywhere in your house and adapted to what you have and where you’d like it. Let’s get started! This is a super simple diy. You literally just wait until you’ve finished your coffee or jam jar then start saving! I usually use my change to save up and I actually got up to £40! This is a great way to save and looks cute to. You could also make it into a candle using melted wax or out fairy lights inside and use them as a lamp. Basically, jars are my favourite things. Ever. Firstly cut the lid off your box. Then cut this into small pieces. Wrap these in your wrapping paper and cover the inside of your box in wrapping paper. Slot your smaller pieces into the box to create sections, but make them a bit bigger so they stay upright themselves. This way you can adjust them to fit your items. I’ve never seen this done before, I literally just made it up this morning when I was organising my room. I really love this and can’t wait to do it again. I basically had a horrible looking black holder that I didn’t like. So I decided to paint it! I did this using nail varnish as I had ran out of acrylic paint and I need to do one more coat of it. On the inside I used white paper to cover the inside. All you’ll need is glue, white paint and paper. Jewellery and bobby pin holders. These are another simple diy. Ages ago I went for afternoon tea and we had jam in these little jars. I took them home and cleaned them out. I now use them to hold my bobby pins and rings. They look super cute on my dressing table and were free ( technically ) I also use the lids to hold my little badges and some earrings. They have little quotes inside. There you go! 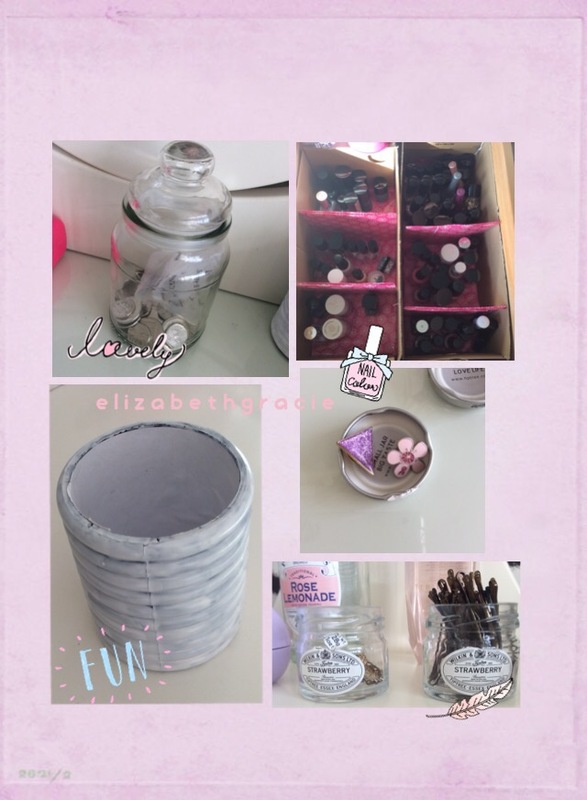 Not one of these diys cost more than £5! Any ideas? Comment them below!